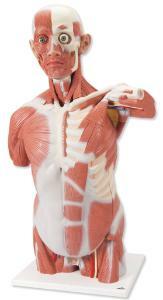 This muscular masterpiece is a detailed aid for anatomic demonstrations. The 27-part muscle torso shows deep and superficial muscles in great anatomical detail. The torso features extraordinary accuracy and life-size design.